The 2018 Winter Olympics are officially underway in PyeongChang , South Korea. 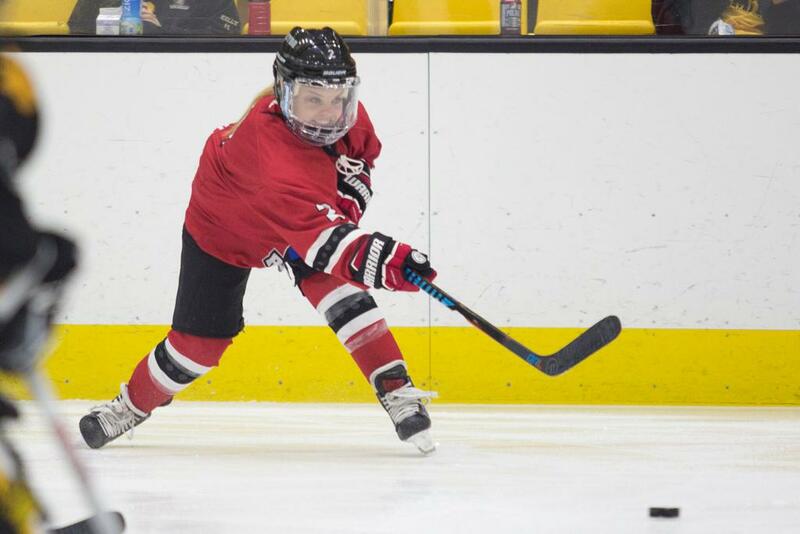 The women’s ice hockey tournament offers NWHL fans the chance to see members of the Founding Four in years past in action at the highest stage of the game. There are 12 NWHL alumna representing four countries in the games (USA, KOR, JPN, OAR). Additionally, the NWHL is now the hockey home of three past Olympians: Lisa Chesson, Michelle Picard and Erika Lawler. For the 2018 Winter Games, Lawler returns to the biggest stage of the sport as an in-studio analyst for NBC. We caught up with the Riveters forward about her return to playing hockey, and the Olympics via broadcasting. Lawler has one goal, four assists and 116 faceoff wins for the Riveters so far this season. She may be a rookie, but she is no stranger to the league itself. As a matter of fact, she served as an analyst on the NWHL broadcasts in the inaugural season. Lawler also served as the Director of the NWHL Players Association in season one. Her involvement started when she met with Dani Rylan only a few months after moving to New York City. “Dani reached out to me because she was actually thinking of trying to start a New York team,” recalled Lawler before a recent Riveters practice. Rylan, the NWHL founder and first general manager of the Riveters, originally intended to establish a team in the Canadian Women’s Hockey League (CWHL). However, over time, and perhaps motivated by something she and Lawler discussed, Rylan’s vision grew. Part of Rylan’s plans included seeking the advice and ultimately the support of pioneers in the women’s game. Lawler, a 2010 Olympian and three-time NCAA National Champion, was one such pioneer. “At the time, Erika may have seen a professional league in the U.S. as an impossible dream, which was understandable. But she was a valuable sounding board and great to brainstorm with,” Rylan commented via email. In addition to joining the broadcasts and leading the NWHLPA, Lawler served on the Player Safety Committee during the 2015-16 season. She also spent time in the league offices in Brooklyn bouncing ideas off Rylan and other staff members. Eventually though, Lawler came to the tough decision to step away from the NWHL. Yet, the ice kept calling her name. Therefore, when the Riveters came knocking again this season, she answered with a yes. Twelve games into the season and Lawler has scored her first professional goal, helped her team to an 11-1 record, and competed against the current Olympic Team with Team NWHL just before they left for the 2018 Winter Games. Lawler and a roster of 21 other NWHL skaters played two exhibition matches against Team USA in January. In addition to connecting with old teammates, the series prepared her for her current studio role. “Now I’ve played against their systems, which are very unique. Their systems are not something you see on the women's side very often,” Lawler said after the Tampa series in January. Additionally, playing against Team USA forced the NWHL players to be more strategic in their play, something that might translate as she and the Riveters aim to reach the Isobel Cup Final for the first time in franchise history. Lawler will prioritize keeping her analysis succinct, while also giving the audience a glimpse into the journey of an Olympian. Lawler is paired with Canadian gold medalist Tessa Bonhomme for NBC studio coverage. Tonight at 10 pm, the two will get their first chance to relive their rivalry as the United States and Canada square off for the first time in the Group A preliminary round. So, what will it take for the 2018 USA Olympic team to bring home the first Olympic gold medal in twenty years? Team culture, Lawler believes. Yet, with the focus must also come the fun! “They should be having fun, it's the moment they've all been waiting for.” Lawler is expecting veterans like USA captain and good friend Meghan Duggan to keep the team focused, and the first-time Olympians will balance the business with the fun. Good team culture is what has made the Metropolitan Riveters successful this season. “I'm really impressed with the team in the locker room dynamic and the culture that we've created this season,” said Lawler. She believes the leadership for the Riveters starts at the top with head coach Chad Wiseman. At the end of the day, the culture is what brought Lawler out of retirement. Amid working a day job, coaching a youth team, and now being selected an analyst for NBC, her time with the Riveters gives her life balance. One must not mistake Lawler’s comments for self-deprecation. Instead, they speak to a diligent work ethic out of respect for herself, her teammates and the game of hockey. In that way, she embodies the attributes and the essence of an ideal ambassador for the women’s game on and off the ice.